Golf trends come and go with big variations throughout the seasons depending on the latest fashions and fads. This autumn promises to be no different with a whole host of styles appearing on the horizon. In this blog post, we take a look at the top 10 trends you may see when playing golf in Marbella this autumn. Golf shoes styled in the classic Oxford type have made something of a come-back recently on the golf scene. American Phil Mickelson was spotted wearing black golf shoes with an Oxford design on the Tour earlier this year. They bring comfort plus a touch of class to your game. The Nike Air trainers worn by Jason Day at the Open were a big focus of attention and right on trend for the latest sportswear in golf. But check out the rules before you arrive to play golf in Marbella – not all courses allow players to wear trainers. Need to know: The Rio Real Pro Shop stocks all the latest in clothing and equipment for the game. Pop along and get kitted out for your next round of golf in Marbella. The latest textiles used in golf clothing mean you can keep cool and comfortable while you play. The newest fabrics keep in the warmth but allow your body to breathe, perfect for the balmy temperatures you’ll find when you play golf in Marbella this autumn. Golf clubs were originally thin with a sharp head, similar to a knife blade in appearance, which is where the term blade comes from. Several professional players have incorporated blades into their game at recent tournaments and in response, golf club manufacturers have introduced them for the non-pro player. Need to know: The Rio Real Golf Academy offers tailor-made tuition and just the right course for you to perfect your swing and putt whether you’re playing with blade or conventional clubs. Non-plain shirts and polo tops are now commonplace on the professional golf circuit. Women players go for animal or geometric prints. Among male players, floral patterns are also popular, worn either subtly or big and bold. If you’re a fan of 9-hole golf, then a Sunday bag is a must on your equipment list. These light-weight bags are much smaller than the traditional golfing bag and as a result, easier to carry. Need to know: 9-hole is one of the biggest trends in golf at the moment. Find out why it’s worth playing just half the course for golf in Marbella. 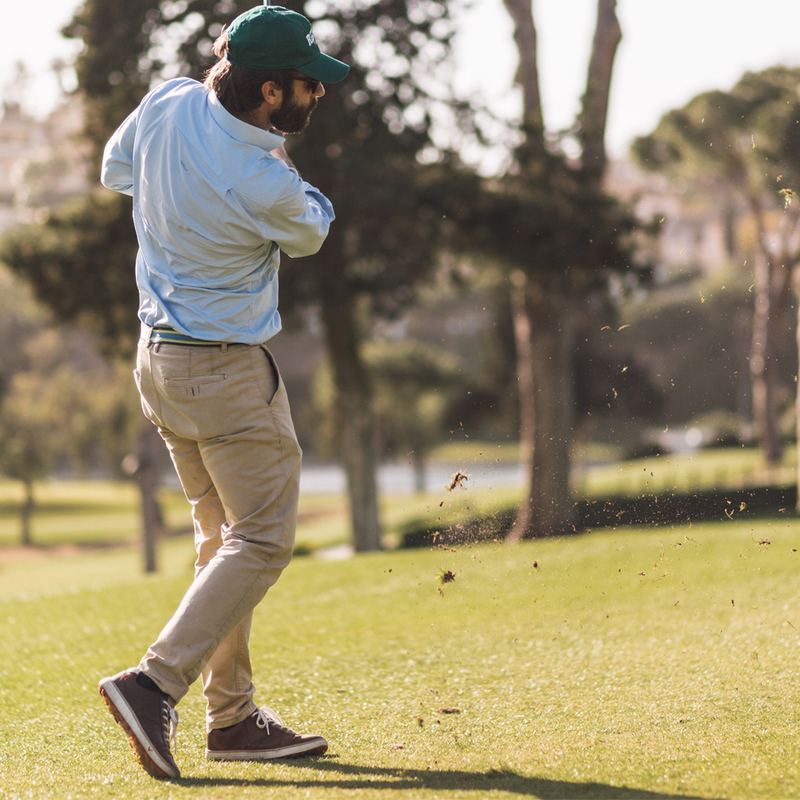 The great year-round climate on the Costa del Sol means you rarely need a jacket when you’re playing golf in Marbella, but in the winter months or first thing in the morning you might need an extra layer. The latest trend for light-weight gilets are perfect. Not only do they give you that extra warmth, they also allow you plenty of room to swing as high as you like. We’re all spending more and more time on our mobile phones and golfers are no exception. And golfing apps are increasingly advanced meaning that many players are turning to them for guidance and advice on play. Need to know: Rio Real golf course has a dedicated app for Android and iOS phone allowing you to book your round of golf in Marbella easily and quickly. Download yours free now. Cashmere joins the trend for light-weight fabrics and is now available in golf wear. Check out the latest models in jumpers and even polo shirts made with cool cashmere. Also hot on trend for golf this autumn are dynamic prices, a system adapting green fees to demand. Golf courses with this system in place offer golfers much better deals and more flexibility for getting those deals. Need to know: Rio Real Golf introduced dynamic prices for golf in Marbella earlier this year. Discover how to use the system to get the very best deals for your game at any time of the year.